While I was in LA, Aaron got me a Snuggie. We had joked and laughed about them a lot... but now I must say I quite enjoy my Snuggie. I can cover up when it's chilly but still have my arms out to type on my laptop. I just wish they came in natural fibers, like cotton. Hmmm bamboo snuggie. Apparently they have Snuggies for dogs too. Wonder how Oscar would like a Snuggie? I saw on TV that Weezer made a snuggie now! Ha! I finally succumbed and bought one on Saturday. I was sitting in my freezing townhouse (furnace is on the fritz) when it hit me, "I sure wish I had a blanket I could completely cover myself with, but with holes for my arms..." and then I thought, "Oh sh**" when I realized just what that was. I'm shocked by how handy and effective it really is. I don't mind a 55 degree house at all! 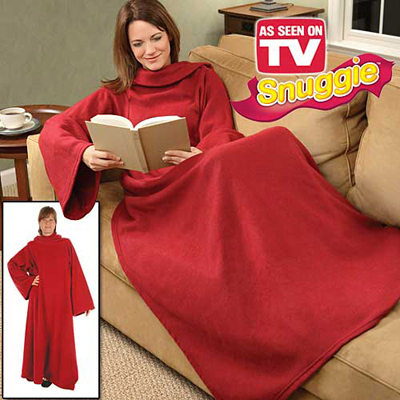 skymall has a snuggie knock off.....the slanklet....really. My husband joked with me last christmas that he was going to get it for me, I really wanted it! I want one for each family member! He thinks I'm kidding LOL.